Industry Experts, Inc. published the new global market report “Industrial Enzymes – A Global Market Overview“. The report reveals that North America is the largest region in the global Industrial Enzymes market with an estimated share of 33%, valued at US$1.8 billion in 2017 and forecast to touch US$2 billion by 2020 while Asia-Pacific is growing faster at a CAGR of 6.9% during 2017-2024. Industrial enzymes are enzymes that find commercial application in a host of industries, including pharmaceuticals, chemical production, biofuels, food & beverage and consumer products. Developments in the recent past have rendered biocatalysis through isolated enzymes more economical than the use of whole cells. Enzymes can be used as a unit operation within a process for generating a required product or can be the product of interest. The recent years have witnessed rapid growth in industrial biological catalysis using enzymes because of their capability of operating at mild conditions and outstanding chiral and positional specificity, properties that are not fulfilled by traditional chemical processes. Demand for industrial enzymes is showing rapid growth due to increasing demand for food and beverages attributed to changing lifestyles and increase in disposable income in a wide segment of the population. Governments across the globe have incentivized the use of biofuels as cleaner alternatives to fossil fuel-based energy options, which has spurred the market for industrial enzymes. Food & Beverages is the largest market for Industrial Enzymes with an estimated share of 26% that is equivalent to US$1.4 billion in 2017, followed by Biofuels and Detergents with 18% (US$969.3 million) and 14% (US$754.4 million) respectively in the same year. Industrial Enzymes in Biofuels is expected the fastest growing segment with a CAGR of about 7.3% through to 2024. The global market for industrial enzymes is forecast to reach US$5.6 billion in 2018. 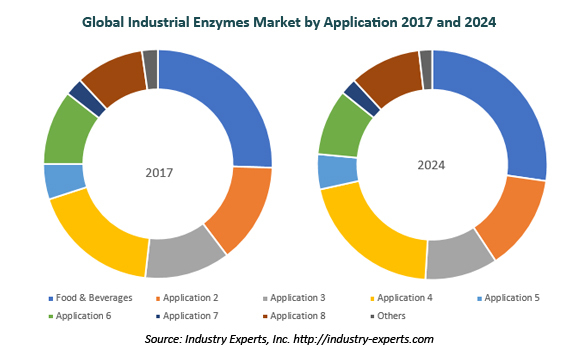 The global market for industrial enzymes product segments analyzed in this study include Carbohydrases, Proteases, Lipases, Phytases, Polymerases & Nucleases and Others. The report also explores the end use markets for industrial enzymes comprising Food & Beverages, Detergents, Animal Feed, Biofuels, Textiles, Personal Care& Cosmetics, Paper & Pulp, Nutraceuticals and Others. The worldwide Industrial Enzymes market, for the purpose of this report, is segmented into five major regions namely, North America, Europe, Asia-Pacific, South America and Rest of World. The regional markets further analyzed for 14 independent countries across North America – The United States, Canada and Mexico, Europe – Germany, France, the United Kingdom, Italy and Spain; Asia-Pacific – Japan, China, India and South Korea; South America – Brazil and Argentina. The report analyzes the Industrial Enzymes market in the above regions by major country, product segment and by end-use segment. This 398 page global industrial enzymes market report includes 256 charts (includes a data table and graphical representation for each table), supported with meaningful and easy to understand graphical presentation, of market numbers. The report profiles 23 key global players and 23 major players across North America – 10; Europe – 7; and Asia-Pacific – 6. The study also provides the listing of the companies engaged in research & development, manufacturing and supply of industrial enzymes. The global list of companies covers the address, contact numbers and the website addresses of 505 companies.